The US Navy is without doubt one of the world's most capable tactical air arms, with an enviable track record in technological and tactical innovation and its application. Since the Second World War, the USN's carrier based tactical aircraft have always played a major role at the cutting edge, often being the first elements of Allied air power to engage hostile forces. Some of the most significant tactical aircraft of the century started their lives in the USN, which has repeatedly demonstrated a very clearsighted view of what a tactical aircraft should be. What is less known is the sad reality, that much of the US Navy's strategic thinking in this area has been repeatedly frustrated by incessant budget cutting and ill considered interference by lay politicians. The result is a situation at this time which is hardly sustainable, as much of the Navy's fleet of tactical aircraft is approaching block obsolescence, and measures for replacement are well behind projected schedules. The US Navy is the only force capable of keeping the Western world's vast sea lanes open in the event of any major conflict, just as it is the only force capable of power projection in those parts of the world, where forward basing facilities are unavailable for Allied land based tactical aircraft. The ability to position a sizeable tactical air arm anywhere in the world, at days of notice, is a major deterrent to many otherwise ill behaved Third World nations. The result of this deterrence is a very false sense of security in the minds of many Western politicians, who repeatedly fail to appreciate the alternatives. The incompetence of the Iraqis in the recent Gulf war has only served to reinforce this unrealistic perception in the minds of the ignorant. The force structure of the USN's current carrier based (CV) air arm traces its origins to the late 1950s and early 1960s, when a series of key developments took place. One of these was the construction of a series of large nuclear powered attack supercarriers (CVAN), supplemented by a series of somewhat smaller but no less potent conventional attack carriers (CVA). During the fifties and the sixties the USN saw its principal roles in maritime supremacy and long range power projection, the latter largely in support of Allied amphibious operations. This philosophy grew from the experience gained during the Pacific campaign and subsequent Korean war, and the composition of the typical carrier air wing of the period reflected this. Another major development was the implementation of Soviet plans to provide the capability to cripple Western shipping lanes in the event of war. This was to be achieved by the application of the world's largest submarine force, supported by long range strike aircraft flying from strategically located forward bases. It is worth noting that some of the most concentrated subversive operations by Soviet intelligence were specifically targeted at installing pro-Soviet governments in nations which were geographically positioned to cover key shipping choke points. Korea, Cuba, Vietnam, Egypt, Yemen, Ethiopia, Chile and Angola are sad evidence of a clearly defined grand strategic objective, which appears to have eluded the comprehension of a great many Western observers, analysts and politicians. The Vietnam air war and its practical lessons were the final development of the period which shaped the path which was ultimately taken by America's naval aviation. Vietnam saw the USN fight medium altitude visual dogfights against nimble guns only dogfighters, while flying strike missions into the world's most dense air defence system, where some areas had thousands of barrels of AAA per square mile. The early sixties saw the deployment of a number of key aircraft types which were to play a major role in the following decades, influencing tactical aviation throughout the Western world. The foremost of these must be the McDonnell F4H-1 Phantom II, a large twin engined all weather (ie IFR) interceptor, armed with AAMs and equipped with a powerful AI radar set. Designed for a 435 NM tactical radius on internal fuel alone, the Phantom outranged most of its potential opponents, which it could outclimb, outaccelerate and outreach with its radar/missile suite. The F-4's superlative payload range and excellent handling characteristics saw its application in the strike role, and it became the first true fighter-bomber of the period. The Phantom's contribution to Western tactical aviation is one with few parallels. What is less known is that the USN had concurrently sought to deploy together with the Phantom another fighter, the single engined F8U-3 Crusader III, a derivative of the existing Crusader. USN policy at that time required that the fleet carried two alternative fighter types, to ensure that serious problems with either of the two would not leave the fleet without top cover. The F8U-3 was a single seat, all weather fighter powered by a 25,000 lb class J75 afterburning turbojet. While it used a thin two position wing with flap blowing, like its ancestor, it also employed two large ventral fins which would swing from horizontal position at low speeds to almost vertical at Mach 2 class speeds. Typically armed with 3 AIM-7 SARH AAMs, one semirecessed on the ventral centreline, the remaining two semiconformally mounted on the lower fuselage sides, the F8U-3 is said to have been faster, more manoeuvrable, cheaper and longer legged than the larger Phantom. Given the success of earlier Crusader subtypes in Vietnam, demonstrating a consistently better kill ratio than the F-4, the F8U-3 would have been the scourge of the NVAF were it deployed. This was not to be, as in 1958 the politicians ruled that the USN must choose one of the two fighters, the Phantom was selected largely due to its 2 man crew and thus better capability in the all weather fleet defence role. The USN's need for long range all weather fleet defence was a major factor in this decision. The emerging threat of the Tu-22 Blinder and later bombers armed with Mach 3 AS-4 Kitchen missiles prompted the USN to initially seek an all weather missileer platform armed with long range AAMs. This aircraft was to have been the the Douglas F6D, a two seat side-by-side 50,000 lb class twin turbofan subsonic missile platform. Powered by a pair of TF-30 fans, it would use its large fire control radar to target its payload of Bendix Eagle two stage Command Link/SARH guided AAMs. Designed for endurance, the Missileer/Eagle system divorced all weather fleet defence from the air combat manoeuvring role. This specialisation would allow the air superiority fighters to be smaller and more agile single seat aircraft, inherently more suitable for dogfighting. Again this was not to be. Robert McNamara, the then new Secretary of Defence, very promptly killed off the Missileer in favour of his pet project, the multiservice TFX. The TFX was to become the controversial F-111, an airframe optimised from the outset as a low altitude long range tactical nuclear strike platform for Tactical Air Command. The USAF mission's mandatory requirements for low level speed and radius performance led to a 70,000 lb design weight airframe, too big and too heavy for most of the USN's carrier fleet. McNamara's intention, as it appears, was to replace the F-4 with the navalised F-111B and thus standardise Navy and USAF tactical fighter fleets. The sad story of the F-111B is covered in substantial detail elsewhere (Coulam's 'Illusions of Choice' contains a superb analysis of the defective decisionmaking processes involved), the result of the mismatched airframe and mission was an aircraft which was marginally usable by 1965, and a USN which was determined to kill the project off. The Navy had by then concluded from experience over Vietnam, that air combat manoeuvring performance was still of fundamental importance. If it was to have a single fighter type for fleet defence and power projection, this type would have to offer excellent ACM performance and the all weather long range weapon system. The idea of a VFAX multirole fighter was conceived during the early sixties, this aircraft was to replace the F-4 and A-7 in the air superiority and strike roles. The collapse of the F-111B program however left the Navy without a fleet defence missile platform, as a result the VFAX acquired the F-111B's massive AWG-9 fire control system and payload of associated AIM-54 Phoenix SARH/ARH AAMs. By 1970 the VFAX had evolved into the VFX which became the Grumman F-14. The F-14 was a very large and heavy aircraft by virtue of its conflicting mission requirements, but offered major performance gains against its predecessors. The USN envisaged three derivatives of the airframe, the interim F-14A with low thrust TF30 engines, the definitive F-14B air superiority fighter, powered by FX (F-15 program) derivative 25,000 lb class powerplants and finally the strike fighter F-14C, in turn a derivative of the F-14B fitted with avionics for all weather strike. The F-14C was to have eventually replaced the aging A-6 subsonic all weather strike aircraft. The A-6 had itself evolved from a late fifties US Marine Corp requirement for a STOL all weather strike platform, subsequently the Navy included extended strike radius as a requirement and adopted the type as its principal all weather strike aircraft, supplanting the ineffective supersonic A-5 Vigilante, which in turn moved to the photorecce role. While the A-6 was a slower subsonic airframe, it was rugged, highly manoeuvrable and had excellent load carrying characteristics. Equipped with the DIANE (Digital Integrated Attack & Navigation Equipment) nav attack system, a multimode radar and later TRIM (Trail & Road Interdiction Mission) electro-optical sensor turret, the A-6 made a major contribution to the USN's air campaign against the North Vietnamese. Its then operators could hardly have conceived of its ultimate longevity. Grumman were almost bankrupted by the F-14A program, given the complexity of the aircraft and the poorly structured contract with the buyer. The escalating cost of the F-14 program also had a profound effect on the planned derivatives. The F-14B was cancelled as was its offspring, the F-14C, the Tomcat having to wait until the 1990 F-14D for its design thrust engines. By the late seventies the USN had a fleet of subsonic all weather strike aircraft derived from a 1958 design. The cost and size of the F-14, and its commitment to the fleet air defence role, led very soon to the resurrection of the VFAX concept. The Navy had sought replacements for the aging F-4, A-4 and A-7 fleets, aircraft which performed the VFR day strike mission and in the instance of the F-4, the air superiority mission. The DoD initially sought to have the Navy adopt a navalised F-15, the Navy responded with an F-14 stripped of the AWG-9/AIM-54. The DoD bureaucracy eventually prevailed and imposed upon the Navy the NACF (Naval Air Combat Fighter) high-low mix concept it had forced upon the USAF with the LWF/F-16 program to supplement the costly F-15. At the time a complex series of studies was conducted by the Navy, the DoD and Congress to select the optimal CVW (air wing) structure for the USN. Various mixes of the F-14, the VFAX, the NACF, the A-6 and A-7 were evaluated in these studies and it appears that none of the studies produced mutually consistent results. By late 1975 the USN had yielded and accepted the F/A-18 program, this type being the NACF derivative of the USAF's Northrop YF-17. The USN's principal objections centred upon the NACF's payload/range performance, which was lower than what the Navy had sought. In practice this meant that a carrier force using the NACF would have to close to shorter range to engage or would have to commit a lot of deck space to tankers. The USN clearly sought a larger aircraft than the F/A-18A, itself quite larger than its ancestor the YF-17. The bureaucracy and politicians however prevailed, and the Navy proceeded with the deployment of the F/A-18 in its then form. The nicest aspects of the F/A-18 were its superlative dogfighting performance and its true multirole capability, although neither of these would have been lost were the aircraft to have been a slightly larger design (as is the current F/A-18E/F). The argument over combat radius later resurfaced during the F/A-18A's opeval trials, with much heated argument about the aircraft's ability to match the payload/radius of the much slower A-7E. The demise of the F-14C and replacement of the F-4, A-4 and A-7 with the short-legged (ie 300 NM class) F/A-18A left the Navy with a major requirement for a modern long range all weather strike aircraft. The A-6 was by design one generation behind the USAF's F-111A/D/E/F and NATO's Tornado IDS, and even ongoing avionic upgrades couldn't compensate for its basic aerodynamic limitations. The USN had set itself an objective in the post WW2 period of attaining a 600 NM over the horizon strike capability from a CV. At this radius it is very difficult for an opponent to engage the fleet, this in turn reducing the resources which must necessarily be committed to immediate fleet defence, ie fighters allocated to Combat Air Patrols (CAP) and Deck Launched Interceptor (DLI) duty. The ability to project power via air superiority fighters and strike fighters at extended radii vastly increases the potency of the CVBG, as more of its complement is available for this offensive mission. Another major gain from increased CV striking radius is that it vastly complicates life for the defending opponent, whose axes of attack toward the fleet will become increasingly constrained with increasing radius, thus rendering any defensive air strikes predictable in geometry. If threat axes are predictable, SAM firing cruisers and fighter aircraft may be readily concentrated, and concentration of fire is always a winning proposition. With increasing CVBG distance from the defending sides' coastal bases, the carrier has more space to manoeuvre and this within itself will create more difficulties for the defending side, who must commit larger resources to long range maritime recce missions. The area to be covered by such recce increases with the square of distance, but resources required for maritime recce are proportional to the area to be covered. To illustrate this with numbers, searching a 45 degree sector out to 300 NM requires coverage of about 35,000 square NM, whereas searching the same sector out to 600 NM requires coverage of about 141,000 square NM. At 1,000 NM this increases to about 393,000 square NM. The square law relationship is most evident here as a factor of three increase in radius results in an order of magnitude increase in area coverage required. The defending side must then either acquire more maritime recce aircraft or accept a very low probability of detecting the fleet. While sensors such as OTHB (eg Jindalee) and RORSATs (Radar Ocean Recce SATellite) can offset this advantage, both have their limitations and both may be subjected to standoff jamming by airborne platforms which will reduce their effectiveness considerably. It is worth noting that the recent Gulf war could have taken a radically different course were the Iraqis to have overrun the Eastern coast of Saudi Arabia, thus preventing the forward basing of USAF and RAF tactical jets. This would have placed far more pressure on the Navy's CVBGs, which would also have to operate at greater radii from their intended targets in view of forward deployed Iraqi strike aircraft. The absence of the F-15/AWACS umbrella would have in turn forced the commitment of far more naval fighters to fleet defence. The payload/radius performance of the USN's tactical jets would have then become a major constraint to operations. The radius performance of the past two generations of air superiority and strike aircraft underscores this point. The sixties F-4/A-4 mix yielded a radius of the order of 300 NM, while the F-14/A-7 mix yielded about 500 NM. The long legged A-6 outranged all of these aircraft, and this translated into much better payloads on target at nominal power projection radii. The current CVW composition of 20 x F-14A/A+/D, 20 x F/A-18C and 20 (or less) x A-6E is severely constrained by the F/A-18C which unrefuelled reaches to 300 NM or so, given catapult launch weight constraints. If the CVBG is to apply its full complement, it will be limited to 400 NM or less with F/A-18s refuelled from KA-6D tankers. The perceived need for inflight refuelling with the existing CVW composition was so great, that the USN had investigated during the late eighties the acquisition of land based Boeing tankers. This in turn led the USAF to evaluate Mk.32 probe/drogue pods on KC-10 tanker/transports to frustrate this attempted Navy intrusion into sacred air force territory. The USN responded to this by nominating the S-3 Viking as the receiver test platform for these trials, with a high aspect ratio lightly loaded wing the S-3 proved to be very tricky to refuel in the wake of the gargantuan KC-10. The status of either program is unclear at this time. As the USN reequipped its CVWs with the F/A-18 during the 1980's, it defined its plans for its new all weather long range strike platform and new air superiority fighter. The strike platform was to have exploited the emerging stealth technologies, while the air superiority fighter was to exploit technology developed in the USAF's ATF program. 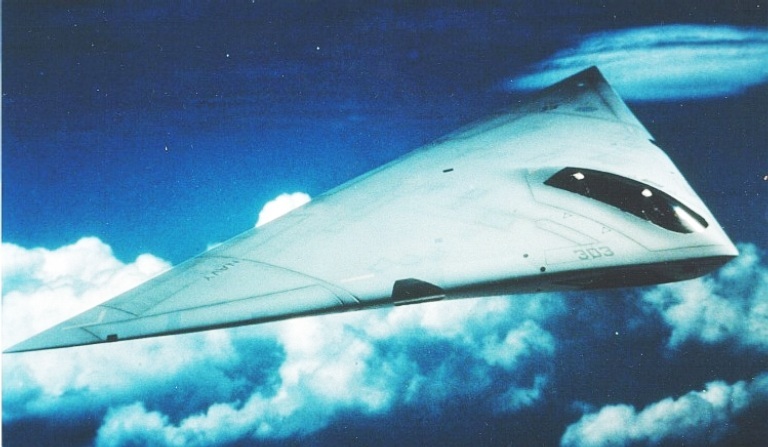 The strike platform would have the penetration performance possessed at that time only by the USAF's secret F-117A, while the air superiority fighter would exploit the supersonic cruise and stealth capability the USAF was specifying into its new fighter. By the late eighties both programs had consolidated and became the Advanced Tactical Aircraft (ATA) and Naval Advanced Tactical Fighter (NATF). These types were to supplant the A-6E and F-14A/D respectively, during the later nineties. The USN had envisaged the deployment of the ATA in the mid nineties, with substantial numbers in service by the turn of the century. As ATA program spending would decline with increasing numbers in service, the NATF would enter development and early deployment with the fleet fully reequipping in the first decade of the next century. The events of January this year have effectively demolished this long term reequipment plan. MDC F-4B Phantom II. The large F-4 entered USN service in the early sixties, as a fleet defence interceptor armed with four heatseeking AIM-9 AAMs and four semi-active radar homing AIM-7 missiles. With superb thrust/weight ratio for the period, a two man crew and a powerful fire control radar, the Phantom had few serious rivals. With the escalation of the Vietnam war, this aircraft ended up being used as an air superiority fighter and fighter bomber, roles in which it performed well in spite of an ill suited weapon system and lack of specialised sensors. Grumman A-6E Intruder. 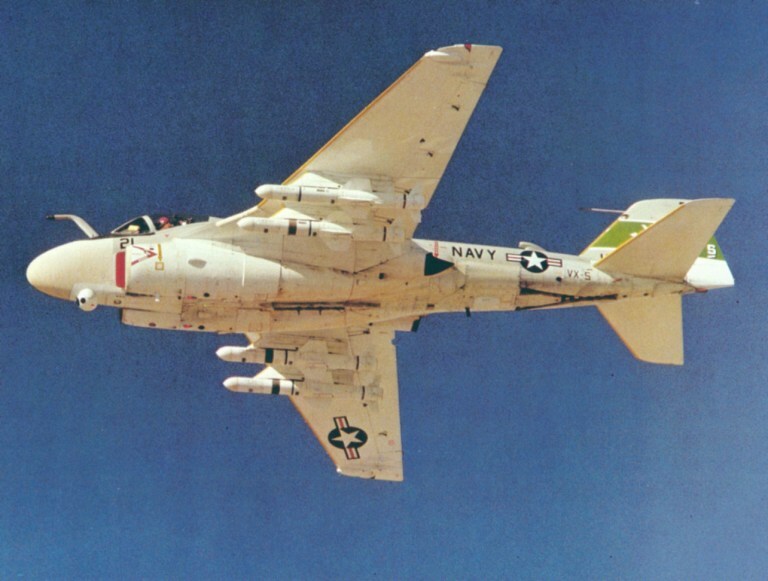 The Intruder was initially designed to meet a USMC requirement for a CAS/strike platform, but with enlarged fuel capacity was adopted by the Navy as a standard all weather strike aircraft. Equipped with the sophisticated DIANE nav attack system, TRIM low light TV/Flir turret and a multimode radar, the A-6 was a star performer in Vietnam, its excellent payload radius performance and low level penetration capability making it one of the most effective aircraft of the campaign. Grumman/GD F-111B. The large F-111B was a role adapted derivative of the USAF's low level tactical nuclear strike airframe. Clearly a case of the wrong airframe for the mission, the F-111B proved to be ill suited to the USN's unique operational environment and was subsequently rejected. This aircraft is an interesting case study of political interference in the force structure definition process, as it was forced upon the USN in spite of its unsuitability for the carrier based missileer air defence role. Grumman F-14A Tomcat. The F-14A was a far bigger and heavier aircraft than initially intended, as the design had to absorb the massive AWG-9/Phoenix weapon system originally intended for the F-111B, itself an oversized replacement for the planned Douglas F-6D. The principal subtype in service today is the badly underpowered F-14A which was meant to be an interim type, until the F-14B with 25,000 lb class engines entered service. The F-14B was cancelled, and its all weather strike derivative the F-14C suffered the same fate. The USN had initially intended to replace the A-6E with the F-14C to provide a strike aircraft with performance comparable to the F-111 and Tornado IDS (photo by LtCdr Dave Erickson, USN). MDC F/A-18A Hornet. The agile F/A-18 was initially resisted by the US Navy as its 300 NM class combat radius was seen as a backward step, contrary to Navy intentions to have carrier based tactical aircraft range out beyond 500 NM. While the F/A-18 has proven to be a versatile and effective combat aircraft, its payload radius limits force carrier battle groups to engage at shorter than desired distances. This requires more fighter assets dedicated to the fleet defence role, which in turn reduces the offensive capability of the whole battle group. The cancellation earlier this year of the US Navy's A-12 Advanced Tactical Aircraft program was major loss for US naval tactical aviation. The stealthy ATA was to become a key element in the USN's carrier warfighting strategy, replacing the now obsolete fleet of Grumman A-6Es, and extending the reach of the Carrier Battle Group to over 1000 NM. The reasons for the killing of the program centred upon development problems which would have led to major cost overruns to rectify, in the post Cold War political climate the Bush Administration could not afford the expense. The result will be an alarming gap in carrier based long range striking capability as the geriatric fleet of A-6Es finally runs out of life, and tactical viability, toward the end of this decade. The full implications of this are not clear until one looks closely at the US Maritime Strategy and the existing CVW composition. The design concept of the ATA dates back to the early eighties, when John Lehmann was Ronald Reagan's Secretary of the Navy. John Lehmann, a naval reservist A-6E Bombardier/Navigator, was a strong supporter of carrier aviation and one of the co-architects of the US Navy's then new Maritime Strategy. A key aspect of the strategy was a very aggressive naval posture toward the Soviet Union. In the event of a major war with the USSR, the US Navy would sail its CVBGs North into the bear's lair and engage the Soviets in their declared naval bastions, the areas immediately surrounding the Kola Peninsula in the Atlantic and the Kamchatka/Sakhalin area of the Far East. A two phase battle was envisaged, initially the USN would engage the AV-MF (Soviet Naval Aviation) and heavily attrit if not annihilate its force of Backfires, Badgers and Bears. Once this had taken place, the carriers would move to within 400 NM of the coast and subject Soviet coastal installations and naval forces to sustained air attack. The strategic plan envisaged ultimately the destruction of the Soviet surface fleet, followed by the sinking of its large SS/SSN/SSGN fleets and the hunting down of its SLBM firing SSBN fleet. The absence of serious Soviet air capability in the latter phase of the battle would allow the USN's SSNs and surface fleet to effectively annihilate the Soviet submarine force, while also destroying its vital support infrastructure and resupply system. As a result, the V-MF (Soviet Navy) would be clearly on the defensive and unable to pursue its principal role, the cutting of Allied shipping lanes. In addition, the Soviets' second echelon nuclear deterrent, the SSBN fleet, would be largely sunken or at least operationally crippled. For the Maritime Strategy to succeed, the US Navy would have to initially defeat the AV-MF without suffering substantial losses in carriers or aircraft. The AV-MF's principal maritime strike aircraft is the Tu-22M Backfire B/C, a supersonic swing wing bomber equipped with Mach 3 AS-4 Kitchen or AS-6 Kingfish anti-shipping cruise missiles (AA July, 1988 in detail). The Backfire has a combat radius of 2,500 NM, much more than the 1,500 NM of the obsolete Badgers and Blinders which it is replacing. Therefore, unlike its predecessors, it can attack a CVBG at substantial radii. The 1,500 NM radius of the Badger and Blinder was a serious operational constraint. The Soviet view of defeating a CVBG on the high seas is one of massed saturation ASM attacks from several axes, to disperse the defending fighters and thus prevent them from destroying the inbound bombers and ASMs once launched. With a 1,500 NM Badger/Blinder radius the CVBG must be within 500 NM of the coast for these bombers to have freedom of choice in axis of ingress to target, at greater radii the bombers have increasingly less choice and thus are subject to increasing concentrations of defensive SAM and AAM fire. The Backfire extends this kill zone out to about 1,000 NM. However, another aspect of the Soviet response to the Maritime Strategy has been the deployment of the long legged Flanker to the Kola and Kamchatka, supported by Mainstay AWACS. With a combat radius of the order of 750 NM, the Flanker could tie down a substantial fraction of the USN's F-14 force, preventing them from engaging inbound bombers and ASMs and thus substantially reducing the concentration of defensive fire. Clearly if confronted by a CVBG, the V-MF could choose not to engage until the fleet had closed to a radius where the V-MF could apply its strike assets to best advantage, this would almost certainly be within the 500-700 NM kill zone radius where the older bombers could be used, and fighter/AWACS support was available. Under these conditions, any contest would be a closely fought win, as the Soviets could apply their assets in the best possible way, while the CVBG would be very limited in its offensive options. The ATA was conceived to swing the balance in this scenario in favour of the USN. Clearly it would be necessary for the USN to force an engagement with the V-MF for the Russians to engage on less than favourable terms. Forcing the commitment of major assets to a high risk engagement would require a major incentive, and the USN saw this in sustained air strikes against high value assets, including the Backfire, Mainstay and Flanker forces on the ground, and key air defence and naval facilities. The capability to apply such pressure from outside the V-MF's best striking radius is not available with existing aircraft. Only the A-6E with inflight refuelling has the radius for such a mission, but its survivability in the face of AWACS directed Flankers, Fulcrums and SA-10 SAMs is not worth contemplating. A stealthy strike aircraft could however bypass such defences, as was repeatedly demonstrated by the F-117A over Baghdad earlier this year. This scenario therefore determined two key aspects of the ATA's design, a combat radius of the order of 1000 NM and all aspect stealth in the face of fighter and SAM defences. Another capability embedded in the ATA specification was the ability to carry the full complement of AAMs, as this would allow the ATA force to be 'swung' into the air defence role to supplement the F-14s and F/A-18s engaging inbound ASM firing bombers. The General Dynamics/McDonnell Douglas A-12A Avenger II was to be a unique trendsetter, being the first ever naval aircraft designed from the outset for stealthiness. The program was shrouded in secrecy from the outset, being a fully 'black' project from its conception. Given the strategic importance of the ATA in the implementation of the Maritime Strategy, this is hardly surprising. The US Navy had originally sought 858 A-12s, to replace the existing A-6 fleet and to bring the long range strike complement of the standard CVW (Carrier Air Wing) to 20 aircraft, consistent with the new generic wing structure of 20 x F14, 20 x F/A-18 and 20 x A-6 or ATA. This was cut late last year to 620, the Navy settling for 16 ATAs per CVW in the interim. The ATA was to be built by a General Dynamics/McDonnell Douglas contractor team, structurally unusual in that the two largest defence contractors in the country were teamed with equal contributions rather than competitive. This arrangement was subsequently proven to be less than suitable, as MDC and GD have always maintained a very competitive mutual relationship. Almost nothing was stated publicly about the program until September last year, when the Navy released the first artists' renderings of the aircraft and limited technical data. This occurred primarily due to budgetary pressure, as the USN did its best to demonstrate the case for the aircraft. Nicknamed the Dorito, the ATA design was a very clean delta flying wing, with a two place tandem cockpit and its two 14,000 lb class nonafterburning F412s embedded in the lower fuselage. A three lobed stealth design with no tail surfaces, the ATA relied upon the differential drag produced by split wingtip speedbrakes to provide yaw control. As a flying wing, the aircraft would have had limited AoA capability, without a tail to provide the nose up pitching download, and therefore required much greater wing area to provide acceptable approach speeds for recovering on a carrier deck. The total wing area of 1,300 square feet is twice that of similarly sized current naval aircraft, which also translates into far greater aerodynamic efficiency in cruise. The low wing loading also provides superb turning performance, with both instantaneous and sustained turn rates estimated to be comparable to an F/A-18. The wing has outboard leading edge devices, and substantial outboard trailing edge flaps, but it is unclear how effective these would be given the need to reconcile the pitching moment associated with flaps, with the tailless design. The central beavertail surface may have been employed for such pitch trimming. The trapezoidal inlets are recessed into the lower leading edge of the wing, feeding the F412 fans via long and hence stealthy inlet ducts. No pictures were released of the exhaust geometry, but it it reasonable to assume these are implemented as horizontal slits, using a similar technique to that in the F-117. The F412-GE400 was derived from the F404, but employs a much bigger fan with a lower pressure ratio, increased airflow and improved resistance to FOD. The compressor employs a new blade design and delivers more airflow than its predecessor. The high pressure turbine was redesigned aerodynamically and uses improved materials, while the low pressure turbine was derived from the design used in the F110, from which the F412 also borrowed a digital electronic control unit. The aerodynamic design, large internal fuel fraction and modern powerplants would have provided the A-12 with excellent payload radius performance. In comparison with the A-6E it was to replace, the A-12 offered a better than 70% increase in payload radius performance and a 40% greater payload capacity. Similarly acceleration performance was better, the USN claiming a loaded A-12 could accelerate 30% faster than a clean A-6E, this being no doubt due to the low wing loading and low drag of the blended airframe. The offensive avionic suite planned for the A-12 was no less impressive. A Westinghouse AN/APQ-183 multimode radar with phased array antennas, visible on the outboard leading edge, would provide a wide range of high resolution groundmapping and surface search modes, while also supporting the AIM-9, AIM-120 and later AAAM air-air missiles. The offensive avionic suite also included an electrooptical sensor package in the nose of the aircraft, this including a Flir device for navigation and targeting. The geometry of the aircraft suggests that a Flir/laser turret like that of the F-117A was mounted ventrally to track and illuminate targets attacked with semi-active laser homing munitions. The defensive suite was to be built around a highly sensitive combined Radar Warning Receiver/Electronic Support Measures (RWR/ESM) system, a first of its kind. Conventional RWRs are optimised for the short range detection of terminal threats and therefore are designed with low sensitivity to preclude spurious false alarms. ESM systems are more sensitive than RWRs as they are employed to sniff for hostile emissions at longer ranges, this optimisation usually results in poor response time and severe limits on the number of concurrent tracks. The A-12's RWR/ESM was to have integrated both capabilities thus providing the aircraft not only with a long range threat warning system, but also with a potent electronic recce sensor. It is very likely that the USN planned to integrate this system into the datalinked fleet wide BGPHES network (Battle Group Passive Horizon Extension System - a scheme whereby long range electronic recce platforms such as the EA-3 and EA-6B can datalink passive target tracks to other aircraft and surface ships). The ATA program developed visible problems late last year, as the design was 8,000 lb over its target weight. In an aircraft with an empty weight of the order of 35,000 lb, this was a serious problem and would require either a major structural redesign or the installation of bigger powerplants, in turn also requiring substantial structural redesign. The development contract which was signed in January, 1988, for the building of 8 development airframes was a fixed price contract worth US$4,800 million and the DoD subsequently estimated that design changes would inflate this cost to US$7,500. Pressure mounted on the USN late last year, after reports that the Navy had repeatedly underestimated cost overruns and schedule delays. This was very damaging politically, as only weeks prior to these statements a Major Aircraft Review was carried out and the DoD were advised that all was well. The USN subsequently dismissed the head of Naval Air Systems Command, responsible for the project, and reassigned the project manager. Reports from the US indicate that the DoD reviewers had in fact paid more attention to project objectives that the actual state of the development work done to date. This was apparently compounded by the 'black' classification status of the program, which meant that many DoD mechanisms for checking project progress were inoperative due to the potential for security leaks. The compartmentalised nature of any 'black' program would have itself caused difficulties in assessing progress in many areas, as few individuals would have been cleared for access to the range of information required to pass a reasonable judgement. Pressure mounted and on the 7th January, the DoD announced the termination of the program, after meetings between the DoD and contractors where Defence Secretary Cheney was advised that additional funds would be required to complete the program. Cheney, at the time deciding under intense budgetary pressure from the Gulf campaign, stated the following: 'This program cannot be sustained unless I ask Congress for more money and bail the contractors out....and I do not believe a bailout is in the national interest...if we cannot spend the taxpayers money wisely, we will not spend it', while acknowledging the Navy's pressing need for a stealth technology strike aircraft. By the time of cancellation, over US$3 billion had been invested in the project. At the time of writing GD and MDC were considering legal action against the US government to recover US$1.6 billion in costs incurred and losses, while the US government was considering similar action to recover US$1.9 billion which it believed the contractors owe the government due overpayment. The A-12 had fallen victim to the ambitious design objectives which much like the USAF's SOR-183/TFX in the 1960s, stretched the technology of the day to the limit. The contractors have correctly pointed out since, that high risk is inevitable if the technology of the day is to be pushed, and that the DoD must accept the implications of this. A GD press release stated: '...A-12 development problems have been the direct result of government insistence on a fixed price contract for a program that is on the cutting edge of technology'. Estimates at the time suggested the loss of up to 10,000 defence industry jobs as a result of the cancellation. The combination of 'black' security status, non-competitive development via fixed price contract and lack of oversight created a situation where any high risk development project is likely to have foundered. The argument that the contractors should have drawn attention to problems at an earlier date is quite naive, as it overlooks the sensitive political relationship which exists between a defence contractor and the contracting service. While the Navy must accept much of the responsibility for the project going off the rails, it was forced into this situation in the first place by funding shortages which prevented it from pursuing a fully competitive dual airframe flyoff such as that conducted for the USAF ATF. Given the importance of the ATA to the USN and planned USAF ATA derivative airframe production to replace the F-111 fleet, it is therefore disappointing that US legislators had given so little forethought to the matter. The replacement for the A-12 is to be the AX for which no funding has yet been allocated. The AX is planned to enter service in 2003, a full 40 years after the A-6 entered operational service, and early indications are that the design requirements have been substantially relaxed against that of the ATA. The AX may carry external payload, compromising stealth performance, and will have a mission radius requirement in excess of 700 NM. This clearly indicates a major fear of incurring any technical risks, something which is already evident in the USAF ATF decision. The ATA cancellation sent political shockwaves through the US services, as contrary to some earlier expectations the very much conventional and hence low risk Lockheed and Pratt&Whitney ATF designs were selected in spite of acknowledged lower performance in a number of key areas, when compared to their technologically innovative Northrop and General Electric competitors. In the interim, additional F/A-18s will be purchased and much of the serving A-6 force will be rewinged to keep them flyable. These very modest measures reflect the painful situation the USN has found itself in, as the acquisition of the AX rather than ATA will fall into the same timescale as the planned acquisition of the Naval ATF (NATF). This will result in a demand for substantial additional funding at that time to avoid the stretching of deliveries with associated losses in economies of scale, and to avoid the by then developing shortage of flyable tactical aircraft. The short term saving in expenditure achieved by the Bush administration in killing the ATA rather than fixing its design problems has only postponed the inevitable to a timescale where it is likely to be less affordable and hence even more painful. The first decade of the next century will see block obsolescence across much of the USN's tactical aircraft fleet. It is worth noting that the A-12, much like the F-111/TFX, ran into late development problems primarily due to the combination of advanced technology and very ambitious performance objectives. 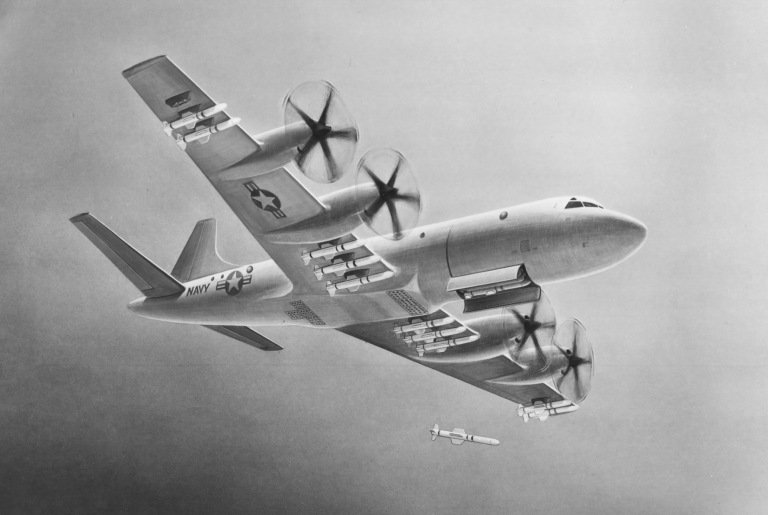 While the US had the economic strength in the sixties to follow through with the TFX project and ultimately produce one of the most capable strike aircraft ever built, a top performer in a front line engagement 27 years after its first flight, the current budgetary situation in the US combined with the political background to the project prevented the A-12 from following a similar path. GD/MDC A-12A Avenger 2. The A-12 Avenger was planned to replace the A-6E in the long range penetration role, while supplementing the F-14, F/A-18 and later NATF in the fleet defence role. 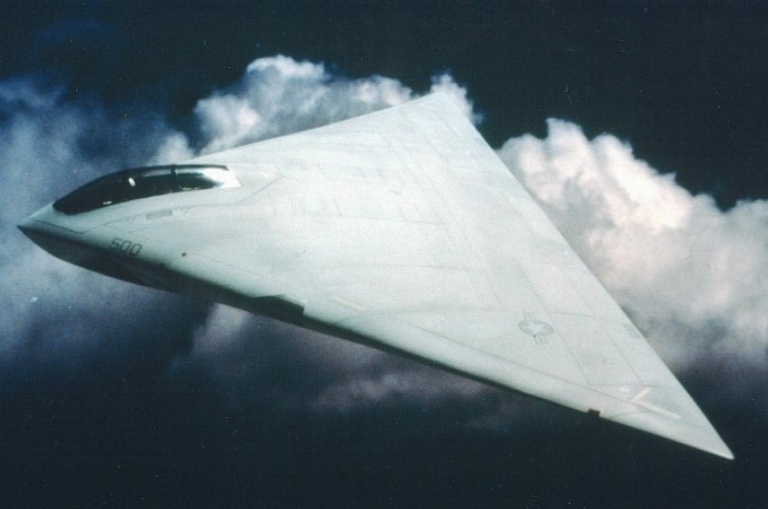 A stealth design with low radar and infrared signatures, the A-12 would have offered similar penetration capability to the F-117A but with vastly superior agility and payload radius performance in the class of the much larger F-111 (US Navy). GD/MDC A-12A Avenger 2. Cancelled earlier this year by the US DoD after developing weight problems during the latter phase of development, the A-12 was designed for a combat radius in excess of 1,000 NM. The combination of stealthiness and large combat radius would have provided the USN with the ability to engage heavily defended targets from well outside of the optimal strike radii of bombers such as the large Tu-22M Backfire. The A-12 was to be a key asset in the implementation of the US Maritime Strategy, as no existing aircraft can perform its role (US Navy). GD/MDC A-12A Avenger 2. The stealthy A-12 was to have carried a sophisticated avionic suite, including an active phased array multimode radar with air to air capability and a highly sensitive integrated Radar Warning Receiver/Electronic Support Measures system. A true multirole design, the A-12 would have performed the long range all weather strike mission, long range electronic recce and the fleet defence role. A range of derivatives were considered for various support roles including AEW, support jamming and ASW (US Navy). GD F-111A/C. 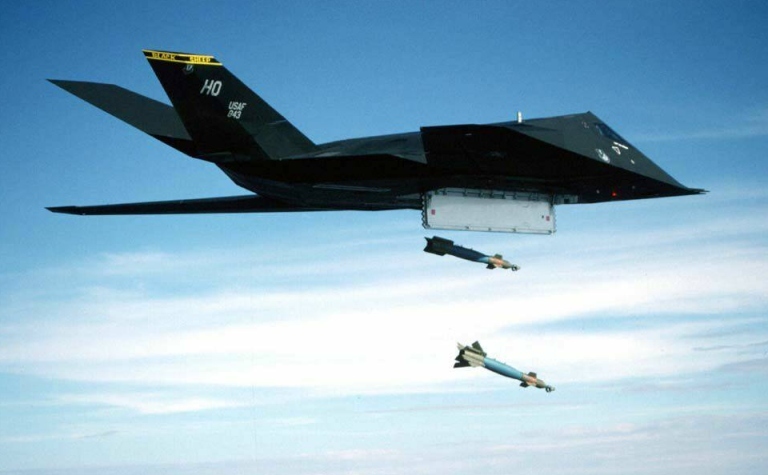 The long range F-111 is the paradigm of a modern tactical strike aircraft, capable of delivering a nominal 4,000 lb payload to a target at 1,000 NM radius on internal fuel. Much like the A-12, it ran into weight problems during early development which led to a relaxing of the initially very ambitious performance specification, in order for the design to be accepted. This occurred since the Kennedy/Johnson administration of the mid sixties had a major political investment in the F-111 project, the A-12 had no such champions in the current Bush administration and suffered a predictable fate. Lockheed F-117A. 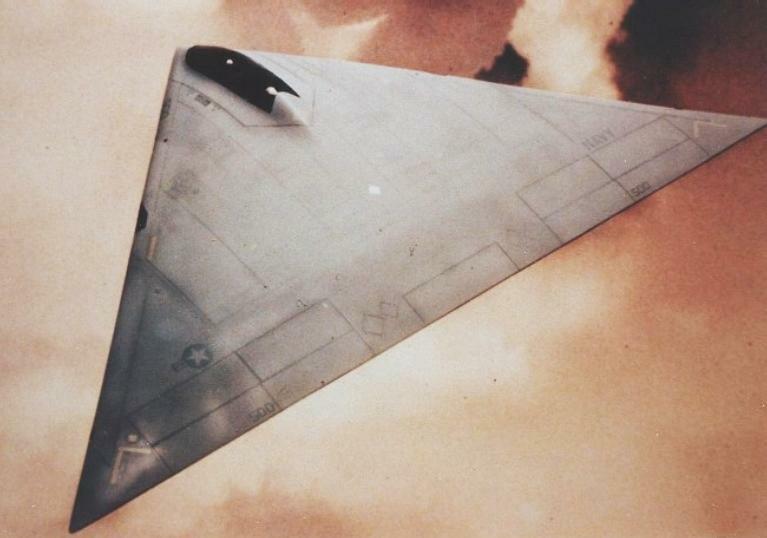 The angular F-117A is a first generation stealth strike aircraft and is reputed to have been quite painful during development, given the need to reconcile the very diverse requirements of stealth and aerodynamics. The USAF however persevered and developed the aircraft to operational capability. The Gulf war proved without doubt the value of this aircraft, which repeatedly attacked the most heavily defended targets with pinpoint accuracy, never incurring losses and always surprising the enemy. Reports suggest that support jammers had to remain off the air prior to the F-117s' run in to target so as not to alert the defenders to the inbound bomber. The cancellation earlier this year of the US Navy's A-12A ATA program has left a serious gap in USN maritime strike capability, as the geriatric A-6E is derived from late fifties airframe technology and lacks the aerodynamic performance and stealth capability to effectively penetrate high threat environments. Interim measures to offset some of this loss in capability include the acquisition of the stretched F/A-18E/F and possibly the modification of the existing F-14 force to provide an additional strike capability. The F-14D is the Tomcat the F-14 was supposed to have been. The D-model represents a substantial advance over its fleet predecessor, the F-14A, with substantially better manoeuvring performance, combat radius performance and a vastly better avionic suite. The F-14D was preceded by the F-14A+, a small number of late production F-14As which trialled a key component of the D model upgrade, the propulsion installation. Both the F-14A+ and the F-14D are powered by a pair of GE F110-GE400 afterburning turbofans. The F110-GE400 is a two spool low bypass ratio (0.85) fan derived from the F101 used on the B-1B and the F404 used in the F/A-18. By combining the core technology of the F101 and fan and nozzle technology of the F404, GE produced and engine with 27,000 lb of afterburning thrust and almost 17,000 lb of dry thrust, with very good fighter handling characteristics. As the GE engine is shorter than the original TF-30 fan it replaces, the tailpipe has been stretched by 50 in. to fit into the F-14 airframe, while the only other design changes involve inlet ramp control and detail changes to accommodate different engine systems. The effect of the additional thrust on F-14 performance has been dramatic, with a 34% increase in CAP loiter time at 150 NM and a 45% increase in radius for 1 hr CAP. Catapult launches no longer require reheat and dogfight manoeuvring performance has been substantially improved. The low thrust F-14A is an excellent dogfighter largely due its computer controlled swing wing and substantial body lift, which translate into good turning performance in spite of the poor thrust/weight ratio. The additional thrust further improves turn performance, while also improving acceleration and climb performance. This provides the F-14A+/D with more manoeuvring options in the vertical, in comparison with the A-model which must play the engagement largely in the horizontal plane. Where the D model improves upon the A+ is in its contemporary avionic suite. Two areas have seen substantial changes, the radar and the mission computers. The now obsolete AN/AWG-9 fire control radar was the most powerful air intercept radar in the Western world, with the capability to concurrently track 24 targets and concurrently illuminate for six AIM-54 AAMs, prior to the missiles transitioning to active radar terminal homing. It also provides a range of dogfighting modes to support the internal gun, AIM-9 heetseekers and AIM-7 SARH missiles. In the F-14D the AWG-9 is replaced with the new APG-71 radar, which uses much of the technology developed for the F-15's APG-70 set. The APG-71 uses some modules from the original AWG-9, but has a new programmable digital signal processor and digital scan control system. The new radar provides monopulse angle tracking, non-cooperative target recognition modes, raid assessment and both high and low PRF modes to expand the range of target speeds which can be usefully tracked. Substantial ECCM improvements have been made, a new antenna with much lower sidelobes is used and a sidelobe blanking channel is employed, these in addition to frequency agility and the ECCM facilities provided by the new signal processor. In addition to the APG-71, the D model retains the Northrop AXX-1 Television Camera System stabilised telescope and adds in a sensitive GE Aerospace passive Infrared Search & Track subsystem. With detection range at altitude of the order of 60 NM, the IRS&T is a potent addition to the sensor suite. The use of the IRS&T to passively detect targets, which can than then be identified by the TCS system allows the F-14D to silently stalk its prey, lighting up its radar only to guide its missiles. The remainder of the A-model's largely analogue avionic suite has been replaced. The F-14D employs a dual Mil-Std-1553B mux bus architecture built around a pair of CDC AYK-14 Mission Computers, a system architecture identical to that used in the F/A-18. Mux bus #1 carries the IRS&T control interface, the ALR-67 threat warning system, the ALQ-126B trackbreaker ECM set, the JTIDS datalink interface, the Tacan receivers, the ASN-130 Inertial Nav equipment, the AHRS and the engine monitor facilities. Mux bus #2 carries the Radar Data Processing system, the mass storage subsystem and the Stores Management System processor, the latter interfacing to a Mil-Std-1776 Stores Control Bus which ties into weapon station decoder modules. As with the F/A-18, an interprocessor 1553B bus is used, while the radar has its own dedicated 1553B bus for control traffic. The forward and aft crew stations employ 1553B bussed multifunction displays (MFD), the pilots panel has two MFDs, one centreline, one right hand side, and a HUD, while the Radar Intercept Officer's station has two MFDs. All MFDs employ peripheral switches as in the F/A-18, to support menu driven software. The production status of the F-14D is unclear at this time. 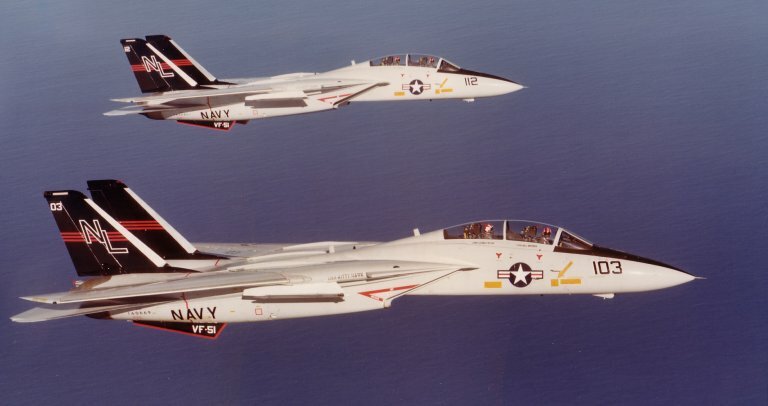 Initial plans were to see Grumman new build several hundred airframes, while also refitting a large fraction of the operational F-14A fleet into D configuration, with the Navy itself refitting the remainder. New production of the D model has been cancelled, and it appears that Grumman's manufacturing program may suffer the same fate, with remaining upgrades done by the Navy itself. While the F-14D offers a much needed growth in air superiority mission capability, it is also significant that the aircraft can easily accommodate changes to support the strike mission. The USN had initiated air-ground weapons separation tests on the F-14A during the seventies, using the BRU-10 ejector racks. The BRU-10 however did not provide adequate ejection force for clean separation of larger munitions, and this together with the spending on the F/A-18 program led the USN to stop the program. In 1988 the USN did rethink the issue, recognising the benefits gained from the multirole capability of the F/A-18. Adding strike capability to another 20 high performance aircraft in every CVW was seen to be a very cheap way of getting more bombs on target, and the Strike Tomcat program was initiated at the Navy test centre at Pax River. The strike capable F-14As will employ the newer BRU-32 bomb rack, mounted via ADV-703 adaptors to the fuselage Phoenix stations. In addition, HUD display modes must be expanded to support air-ground delivery symbology and the ballistic computer must have its equations changed to reflect current ordnance and delivery profiles. The integration program was well under way at the time of writing, with F-14s delivering payloads of four Mk.84 2,000 lb bombs. Follow-on objectives include the integration of the AGM-88 HARM antiradiation missile and the Harpoon antishipping missile. The strike capable F-14A will suffer the limitations associated with a weapon system optimised for the air superiority mission, and it lacks the sensor suite required for all weather precision delivery. Given the expense in integrating such devices into an obsolete weapon system, it is unlikely to happen. However the 1553B based digital avionics of the D model could accommodate additional sensors far more easily. Grumman had on this basis proposed the use of the F-14D as a gap filler until the AX reaches the fleet. Strike capable F-14Ds would be designated F-14D Quickstrike and would include additional air-ground radar modes such as synthetic aperture high resolution groundmapping, Doppler beam sharpening, fixed target track and support for a range of PGMs. Navigation and attack Flir pods would be fitted. Cockpit upgrades would include a raster scan HUD for the Flir, colour displays and NVG compatible lighting. HARM and Harpoon capability is included. Follow on derivatives of the F-14D would include the further upgraded Super Tomcat 21 and its derivative, the Attack Super Tomcat 21 (AST-21), the upgrade path culminating in the ATF technology ASF-14. Grumman's strategy has been to offer incremental upgrades which may be retrofitted into the existing F-14A fleet by block upgrades. The F-14D Quickstrike is a conservative upgrade involving primarily software enhancements to the existing design and the addition of navigation and attack Flir pods, while the Super Tomcat 21 and Attack Super Tomcat 21 include substantial structural and system upgrades. The Super Tomcat 21 would see the addition of a composite 3 segment single slotted Fowler flap, an extended chord 2 segment composite slat, enlarged wing gloves containing fuel tanks with 2,200 lb capacity and an enlarged horizontal stabiliser. These would provide 25% more lift with a 5% weight penalty. With two 425 USG nacelle drop tanks this configuration would offer in excess of 28,000 lb total fuel capacity, yielding a 50 to 100% increase in combat radius for a range of mission profiles. Additional thrust would be provided by a pair of F110-GE-429 or navalised P&W F119 powerplants, and an APU would be fitted. The new powerplants would allow for Mach 1.3 supercruise, a capability absent in current naval aircraft. 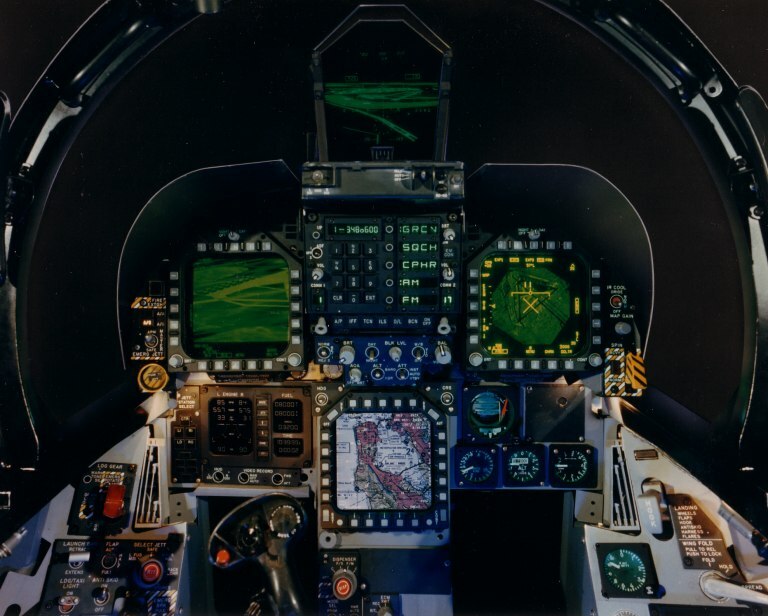 System upgrades would see new VHSIC based implementations of the Navy standard AYK-14 mission computers, helmet mounted cockpit displays and large colour head down displays, with forward visibility improved by a single piece windshield. The aircraft would retain the existing ASW-27C datalink. The ALQ-165 ASPJ trackbreaker jammer would be enhanced to a two transmitter configuration, and over twice the volume of expendables would be carried. The Super Tomcat 21 would have a further improved radar with an electronically scanned phased array antenna which would substantially improve detection range. In addition, inverse synthetic aperture and ground Moving Target Indicator modes would be added. The Attack Super Tomcat 21 has additional equipment dedicated to the strike role, this including the phased array radar developed for the A-12 ATA, with terrain avoidance and terrain following modes, a wide field of view HUD, a digital moving map display and GPS satnav. The aircraft would be capable of carrying up to 24 Mk.82, 14 Mk.83 or 6 Mk.84 free fall bombs, or up to six AGM-84 Harpoon rounds. The final evolutionary upgrade proposed is the ASF-14, which would employ a new wing, ATF technology powerplants and a number of system upgrades derived from technology used in the ATF. Whether all F-14As and Ds eventually become strike capable and what additional offensive avionics they will acquire is unclear at this time. The USN's pursuit of the E/F model Hornet has further clouded the issue, as the F/A-18E/F has comparable strike payload radius to the F-14D for a range of profiles and is already fully integrated with the Navy's air-ground weapon suite and a range of suitable sensors. At the time of writing a major debate on this subject was taking place in the US. The F/A-18E/F is the Hornet the USN would have liked to have had from the outset. A direct evolutionary development of the A/C model, the E/F model employs a fuselage stretch, bigger wing, more internal fuel and more powerful engines than its predecessor. 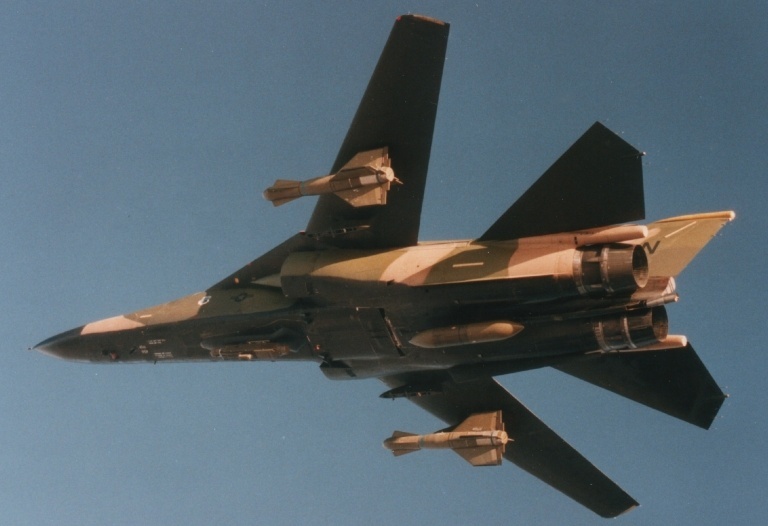 MDC had proposed a range of enhanced Hornet derivatives during the late 1980s, these involved a range of incremental changes such as higher thrust engines, a larger dorsal hump with more internal fuel, a larger wing and improved all weather air-ground sensors. The most radical proposal involved a major structural redesign with a new wing and canards. The F/A-18E/F is a rather conservative airframe and propulsion upgrade, involving the addition of a 34 in. centre fuselage plug, a 25% larger wing area, 25% larger horizontal tail surfaces and new powerplants. The powerplants initially proposed are 22,000 lb afterburning thrust derivatives of the F404, using much of the technology applied to the F412 powerplant developed for the A-12. The GE proposal would see a new F404 which employs the core developed for the F412, with a low pressure turbine derived from the F110 and and full authority digital electronic control system, also derived from the F110, and a new afterburner stage derived from the new F120 used in the ATF program. However, Pratt&Whitney and GM Allison have also expressed interest in supplying the new powerplant, with P&W proposing a new engine design and GM Allison expected to propose a derivative of the GMA 800 technology demonstrator engine. The structural modifications to the Hornet design are substantial. The larger wing will require appropriate changes to fuselage structure and will differ from the existing wing in having an additional outboard weapon station. The larger wing together with the fuselage plug will increase empty weight to 30,000 lb and increase internal fuel capacity to 13,900 lb, both in the class of the F-15. The new powerplants will require the resizing of the inlets and ducts for increased airflow. The performance gains of the new configuration are not trivial. The combat thrust/weight ratio is improved by almost 10%, while the CAP loiter time at 400 NM is almost doubled. The improvement in radius performance is so great, that the aircraft on some profiles betters the much larger F-14D, which it also easily outclasses in transonic manoeuvring performance. The cockpit of the E/F Hornet will also see changes, with the adoption of a large 8x8 in. colour multifunction display in the centre position, the two outboard 5x5 in. displays being retained. The HUD up front control panel will be upgraded with a touch sensitive flat panel display device. The avionic suite will see the APG-65 radar eventually replaced with the much more capable APG-73, Global Positioning System satellite navigation added, an automatic target handoff system datalink incorporated and provisions for the AIWS standoff munition and the AAAM missile, the planned replacement for the AIM-54 Phoenix missile. The USN at the time of writing envisaged the phasing in of E/F Hornet production in 1995/6, with development commencing in 1992. This has been interpreted by some US observers as the USN yielding to DoD pressure to finally kill off F-14D production, the USN acquiring an alternative fighter approaching the same payload/radius class. It is very likely that the E/F Hornet will also kill off any major plans for all weather strike equipped F-14D derivatives, as the concurrent expense of two such programs will not be affordable if the AX is to enter development. The performance issues involved in comparing two radically different airframes such as the F-14D and F/A-18E/F cannot however be easily trivialised into comparing a single mission profile. Grumman have argued strongly that the F/A-18E/F cannot achieve the payload/radius of the F-14D at the same high Mach number, as the drag of the large external tanks will rapidly eat into radius at supersonic speed, unlike the semi-conformal tanks carried by the F-14. Grumman figures suggest that a fleet defence mission involving 90 minute loiter, a Mach 1.2 engagement, and a 4 x BVR/2 x AIM-9 missile loadout would see the F/A-18C/D achieve a 120 NM radius, the F/A-18E/F a 260 NM radius, while the F-14D and Super Tomcat 21 could achieve 350 and 430 NM respectively. On strike missions with an 8,000 lb payload of 8 x Mk.83, where the F/A-18 is penalised due to the loss of external tanks, Grumman argue that the F/A-18C/D will achieve only 190 NM, the F/A-18E/F 265 NM, while the F-14D and Super Tomcat 21 will achieve 400 NM and 500 NM respectively. 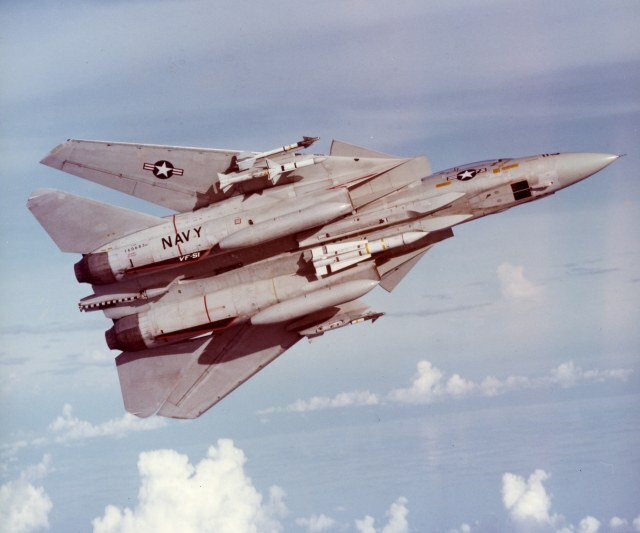 Grumman have also argued that the larger F-14 will have an inherent advantage in the area of air-air sensors, as the F-14D already carries a TV telescope, IRS&T set and its radar produces 6 times the average peak power of the APG-65 with twice the antenna area, resulting in twice the detection range and 14 times the search volume. The battle to save the F-14 is vital to Grumman who may cease to produce any airframes if the program is killed off. The DoD and the official Navy position has however been, that the F-14 is a necessary sacrifice required in order to retain the 12 CVBGs projected for the early 21st century. The cost of the new F-14s would apparently threaten the funding required to keep the carriers, and the USN considers the need for the F-14 to have diminished with the decline of the Soviet Empire, as the saturation Backfire/Kitchen/Kingfish attack scenario is increasingly unlikely. At the time of writing Grumman even proposed substantial cost reduction in the aircraft, in order to match MDC's price. To complicate this debate, the USN was to have acquired a derivative of the USAF F-22A ATF or the Northrop YF-23A technology demonstrator as an eventual replacement for the F-14D in the long range air superiority role. Whether this occurs and whether deliveries take place before the end of the decade is very uncertain at this time. A navalised derivative of either the F-22A or the YF-23 is not a trivial proposition in terms of development costs and this will bear heavily upon any USN decisions to spend on tactical aircraft development. Without the Naval ATF (NATF) the USN faces a severe shortage of air superiority airframes by the middle of the first decade of the next century, when much of the F-14 and F/A-18 force will have been worn out, airframe life expended and maintenance costs soaring upward. The death of the A-12 has severely disrupted the USN's schedules for deployment and spending, the resulting AX expenditure falling into the same time frame the NATF was to have occupied. Without a major and unplanned for injection of funding, the USN will now face block obsolescence across the tactical aircraft fleet in the first decade of the next century. As additional funding is not likely, the probable effect this will have will be a stretching of deliveries and protracted period of reduced capability. The problems which the USN has suffered in acquiring the force structure it requires to implement its strategic objectives are not surprising. The philosophy of defining strategic objectives and fitting technology to the role is appropriate as the technology can be optimised for the roles and thus yield better performance/price ratio. This contrasts with the idea of fitting a warfighting strategy to available assets, which has a tendency to hamper longer term force development by imposing artificial and often strategically irrelevant constraints. A key issue in the USN's battle for assets has been tactical radius performance, as it is this parameter which has fundamental implications in naval engagements. The ability to outrange an opponent severely constrains his offensive and defensive options, and this allows the CVBG commander to concentrate his resources more effectively. The USN's initial resistance to the 300 NM class F/A-18 is clearly understandable in this context, as a third of its offensive and defensive capability is unusable unless the CVBG closes to this distance. The 1000 NM radius class stealthy ATA would have provided the USN with an offensive capability against naval and coastal assets at radii where the CVBG is very difficult to engage even by the most sophisticated opponents. The adoption of the F/A-18E/F and strike capable F-14 derivatives cannot be a substitute for the ATA, as even these aircraft are constrained to 500 NM class radii. The use of tankers is an option, but the limited deck space of a carrier severely limits the numbers of such specialised aircraft which can be dedicated to a support mission. Land based tankers are not a serious option during blue water operations, as their operational flexibility is severely limited by long transit times to station, which will also severely impact fuel offload capacity. Arguably land based tankers would be most useful and most usable in engaging the Soviet Northern and Far Eastern fleets, but the scenarios involved would most likely see the tankers' land bases subjected to interdiction by Fencers and Backfires escorted by Flankers. Much debate has centred on the usefulness of the CV in the modern environment, where hunter killer submarines and strike aircraft both fire potent anti-shipping cruise missiles. Many naval strategists have argued that the CV is at the end of its useful life, as it must dedicate more of its air assets to defensive operations than to offensive operations. This argument is however sensitive to the issue of tactical radius performance, where a CV is equipped with short legged aircraft the argument carries some weight, where the CV's strike aircraft can outrange defending aircraft, the argument is meaningless. If a CVBG is to wage a classical two phase air battle against a land based opponent, superior tactical radius will ultimately translate into defeat for the land based side, who cannot engage the CVBG directly and will be subjected to counter-air and interdiction operations against its fixed bases. An interesting case study is the Japanese advance into the Pacific in 1942, where the A6M2 Zeke consistently outranged all of its opponents with devastating consequences for the defending Allies. Were the deception at Midway to have failed, the Allies would have had to have waited until substantial numbers of F6F and F4Us became available, before they could take the initiative. Similarly the role of the P-51 Mustang in the European air battles of 1944 cannot be overlooked. The alternative is to suffer all or even more of the pain the Royal Navy did in the Falklands, its short legged Sea Harriers being unable to maintain air superiority in spite of a superb air-air kill ratio in those engagements which did take place. The Australian observer must never lose sight of this reality. The RAAF's commitment to the F-111 force is above all due to the aircraft's 1000 NM class tactical radius. Successive governments and generations of bureaucracy have proposed replacing the F-111s for a wide range of reasons, clearly all of these individuals display a fundamental and inexcusable ignorance of what matters in air warfare strategic terms. The US Navy is suffering the consequences of this mindset, with legislators repeatedly denying the resources required for the CV to perform its role effectively. As a result, the USN will have to engage upon less than optimal terms in many scenarios. A Third World opponent bristling with Fencers and Flankers could very well be one of these. Without appropriate aircraft the expense in building and operating large vessels such as carriers may not yield the desired payoff, as the asset will be far more exposed to hostile action than it necessarily need be, or will have to commit much of its complement to fleet defence operations at the expense of offensive power projection. The assumption that all opponents will be of the calibre of Iraq is both naive and dangerous, and hardly the basis for rational force structure planning. Australia is a maritime nation and therefore must consider the capabilities of both it opponents and allies when planning its force structure. The USN's ongoing difficulties with the implementation of its desired CV complement force structure suggest that the USN may have to play more cautiously in the latter phase of the decade. It would therefore be prudent for Australia to look very carefully at the constraints likely to be imposed by this situation, and ensure that our force structure allows for these. Acquisition of additional boom/probe tankers would be a step in the right direction. As the Gulf conflict clearly demonstrated, the post Cold War world is likely to be more turbulent than the past three decades, as the existing power blocs relax their hold on Third World governments. Not to be prepared could prove to be more expensive in the long term than any current expenditure on assets. References: Friedman N., 'The US Maritime Strategy', Jane's Publishing Company, 1988. Grumman F-14A Tomcat. The digital F-14D is is to enter service in 1993, providing the thrust/weight performance the US Navy had sought to introduce in the mid seventies F-14B, which was cancelled for budgetary reasons leaving the USN with a fleet of underpowered TF-30 fitted A models. The F-14D has an avionic system very similar to that of the F/A-18 and is fitted with an upgraded digital APG-71 radar set and GE Infrared Search and Track Set, while retaining the Northrop TCS stabilised TV telescope system. MDC F/A-18E. The enlarged and more powerful F/A-18E/F is much closer in performance and combat radius to the VFAX the USN had sought in the early seventies. With a combat thrust/weight ratio similar to the F100 powered F-15C, the E model Hornet has similar combat radius performance to the much larger F-14D. Design changes include a fuselage stretch, 25% bigger wing and horizontal tail, 22,000 lb thrust engines, 26% more internal fuel and cockpit and avionic upgrades. Sukhoi Su-27 Flanker B. The agile and long ranging Flanker has been deployed to the Kola Peninsula and the Far East primarily to thwart the US Maritime Strategy. With superior radius performance to the F-14D and excellent air combat performance, the Flanker has become a major factor in naval warfare scenarios. Currently in the process of carrier qualification, the Flanker will eventually deploy aboard the USSR's new fleet of CVs, while numerous Third World sales are expected. MDC F/A-18E Cockpit. The E/F model Hornet will see a major cockpit upgrade, with a high resolution 8 x 8 in. central display displacing the existing 5 x 5 in. unit. In addition, a new up front control panel will be fitted, and a high performance HUD capable of supporting raster scan graphics for AAS-50 TINS FLIR display. The aircraft will carry GPS satellite navigation equipment, and the radar will be upgraded to a newer APG-73. MDC F/A-18A Weapons. Modern tactical strike aircraft must have the capability to carry a wide range of air-surface weapons to cover the diversity of targets to be engaged. With increasing tactical radius and choice of weapons, the strike commander has greater freedom in planning his strike to minimise losses and maximise target damage. This F/A-18A aircraft displays the standard USN air to surface weapon suite. Lockheed's P-7A LRAACA was to have replaced the P-3C fleet, but this program also collapsed during the 1990s. The P-8A MMA is to now replace the P-3C fleet (Lockheed).